The benchmark price of iron ore on Thursday jumped 3.8%, staging a comeback from 18-month lows hit at the start of the week. According to data from the The Steel Index, the import price of 62% iron ore fines at China's Tianjin port added $4.10 to $111.50 per tonne, clawing back much of the losses suffered on Monday when the price of the raw material dropped more than 8% to $104.70. The globe's most active steel future – Shanghai rebar – has also improved slightly to around $530 a tonne from a record low set on Wednesday. At the same time China's steel output has recovered, rising almost 6% to 2.08 million tonnes a day in the last eight days of February from the preceding 10-day period, according to the China Iron and Steel Association. This is also better than 2.07 million tonnes daily average for last year. However, data released on Thursday showed investment growth – the engine of China's economic growth for decades – came in way below expectations after after both property sales and new construction contracted. 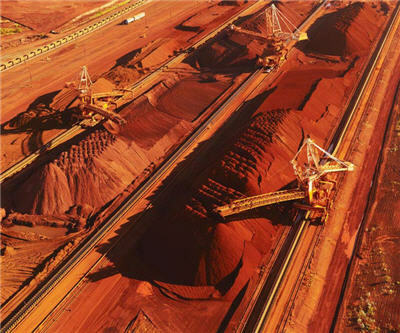 Iron ore is down nearly 17% since the start of the year as China's steel sector – which consumes more than two-thirds of the seaborne iron ore trade and forges almost as much steel as the rest of the world combined – adjust to slower growth in the world's second largest economy. Iron ore's recovery from the plunge Monday is in stark contrast to copper's performance which has continued to fall and now trades at the lowest since June 2010 as economic growth shocks in China keep coming. While a bounce back from levels below $105 this week was expected the fundamentals in the industry remain poor. Iron ore stockpiles continue to grow and imports slump. As is the case with copper, the stockpiled iron ore is not being put to industrial use, but because of tight credit conditions inside China the ore is being used as collateral to secure loans. About 40% of the more than 100m tonnes of iron ore at China’s ports are part of finance deals, according to some estimates. Borrowers, forced by their bankers to repay loans will have to sell the ore into an already well supplied market and in the process push down market prices even further. "Our view that Chinese crude steel production is expected to peak at 1.1 billion tonnes, around 2025, is unchanged. We remain confident that global demand for iron ore will continue to grow, though at a more moderate rate, driven by urbanisation and industrialisation,” he said." Chief executive of iron ore at Rio Tinto (LON:RIO), Andrew Harding told the conference this credit squeeze is the main reason behind the recent drop in the price: "The longer term is still intact. I can’t see any change to forecasts. I expect volatility on a regular basis, [but] the longer term is still intact. I can’t see any change to forecasts." With marginal costs of as low as $50 a tonne, the Brazilian and Anglo-Australian giants should be able to weather the storm, but smaller producers, particularly those inside China will find it tough going. The big three are targetting massive expansion. BHP said its on track to up production at its newest mine Jimblebar to 55 million towards its longer term target of 270 million tonnes per annum. Rio Tinto is most aggressive – it is ahead of schedule to reach 290 million tonnes per annum and further out 360 million tonnes per annum is the forecast. Vale has been struggling to keep up with the Pilbara producers but the company is nevertheless sticking to its medium term expansion plans to lift its output above 400 million tonnes from the current 300 million tonnes-plus.